While this basic picture has emerged as the consensus reality among health care experts, their evidence has been primarily anecdotal. Hospitals have protected their price lists -- documents known as charge masters -- as closely guarded secrets. Their prices are secret no more. The database released on Wednesday by the federal Centers for Medicare and Medicaid Services lays out for the first time and in voluminous detail how much the vast majority of American hospitals charge for the 100 most common inpatient procedures billed to Medicare. The database -- which covers claims filed within fiscal year 2011 -- spans 163,065 individual charges recorded at 3,337 hospitals located in 306 metropolitan areas. The Obama administration shared the data in advance with The Huffington Post, The New York Times and The Washington Post. What emerges through a preliminary analysis is a snapshot of an incoherent system in which prices for critical medical services vary seemingly at random -- from state to state, region to region and hospital to hospital. These price differences impose a uniquely punishing burden on the estimated 49 million Americans who have no health insurance, experts say. They are the only ones who see on their bill the dollar amounts listed on these official price lists. Yet these same prices effectively shape what nearly everyone pays for health care, because they determine how much private health insurance companies must surrender in reimbursement for services. That in turn influences the size of the premiums that insurance companies charge their customers. Obama administration officials declined to characterize the causes of these gaping disparities in price, leaving unclear whether they reflect some form of malevolence -- profiteering by some institutions or price-rigging -- or rather more nebulous factors, such as varying estimates about the underlying costs of providing services. Administration officials said they offered up the data with hopes that its release would administer a market corrective, forcing hospitals to take greater heed of competitors while arming ordinary people with information they could use to seek a better deal. The data could also spur health insurance companies to negotiate with hospitals to seek lower prices. "Our purpose for posting this information is to shine a much stronger light on these practices," said Jonathan Blum, director of the Center for Medicare. "What drives some hospitals to have significantly higher charges than their geographic peers? I don't think anyone here has come up with a good economic argument." The very fact that prices are now public may bring change, he added. "Hopefully, it will cause hospitals themselves to take a hard look at their charge-master practices and to ask hard questions of themselves as an industry why there is so much variation," he said. Public access to this data on hospital charges pulls back the curtain on one of the most troubling characteristics of the American health care system: Medical providers set their prices in ways that seem arbitrary, with little oversight and practically no market incentive to reduce them, because almost no one actually pays the official rates. The data lands as unexpected health care bills continue to be a leading cause of financial ruin for American families. Uninsured and low-income people are often subject to aggressive debt collection by hospitals and their agents when their illnesses result in bills they cannot pay. Even among people of means, skepticism about American health care is common and with reasons based in data: Americans typically pay higher prices for health care than people in other countries, without gaining higher-quality care or superior health. The new trove of billing data seems certain to amplify calls for a solution to rising medical costs -- not only for ordinary people, but for the economy as a whole. Health care spending continues to grow faster than the economy, though the rate of increase has slowed in recent years, prompting hopes that a fix may be materializing. In 1999, average charges billed to Medicare were equal to 104 percent of the cost to provide medical care, according to a report issued last June by the Medicare Payment Advisory Commission, an expert panel that counsels Congress. By 2010, the ratio had more than doubled to 218 percent. The Centers for Medicare and Medicaid Services long has had access to hospital charges via the cost reports facilities must submit to the agency, said Blum, the Obama administration official. Before now, few had given a thought to making the data public. His agency's actions were inspired in part by a sweeping Time magazine article on hospital charges by author Steven Brill published in March, Blum said. The newly released data covers facilities that were collectively responsible for 90 percent of inpatient claims to Medicare while excluding certain institutions, such as children's hospitals and cancer centers. The Huffington Post reviewed the two dozen types of services billed to Medicare at least 100,000 times in fiscal 2011 in 13 metropolitan areas spanning the U.S. The locations varied in population from less than 1 million to the largest three metro areas: New York; Los Angeles; Chicago; Portland, Ore.; Austin, Texas; Jacksonville, Fla.; Richmond, Va.; Birmingham, Ala.; Tucson, Ariz.; Honolulu; Madison, Wis.; Provo, Utah; and Chattanooga, Tenn.
How is it possible that two hospitals in close proximity would set prices as differently as Bayonne Hospital Center in New Jersey and the Lincoln Medical and Mental Health Center in New York? It's partly a relic of how hospitals used to operate and partly reflects their strategies to maximize revenues in ways that don't have a direct connection to the cost of the care they provide any individual patient. "The charge masters are totally irrational," Robert Laszewski, a former health insurance company executive who consults for health care companies as president of Alexandria, Va.-based Health Policy and Strategy Associates, wrote in an email to The Huffington Post. Hospitals used to base prices on health care costs and on the need for profit that would, among other things, enable them to make investments in their facilities, Laszewski explained. "They became the baseline from which the hospitals started," he wrote. But over time, hospitals raised charges in anticipation of negotiating discounts with private health insurance companies while maintaining their revenue streams, he said. Prices have continued growing over decades to the point where there is no plausible justification for them, according to Laszewski: "Over the years, the charge masters have become more and more disconnected from reality." The charges are the prices hospitals establish themselves for the services they provide. Although Medicare and Medicaid don't base their payment rates on these figures, private health insurance companies typically do, which means they usually pay more for the same health care than the government does. That translates into higher premiums for people with insurance. And uninsured people are expected to pay the full list price or a discount from that number, which tends to mean they pay more than anyone else. When a hospital doesn't get paid as much as it wants from one source, it tries to make up the difference in other ways, such as billing so-called self-pay patients -- almost always the uninsured -- for the full list price of a service, said Robert Huckman, a health care expert at Harvard Business School. Even when hospitals agree to huge discounts for patients who can't pay the bill, those discounts are taken from inflated prices much higher than those the government or private insurance companies pay, he said. "The charge master is complete nonsense that really doesn't matter -- unless you are an uninsured person and you're getting these huge bills driving you toward bankruptcy," Laszewski wrote. "The biggest irony of the U.S. health care system is that only the uninsured -- often people who don't have a lot of money -- are the only ones the hospital expects to pay these incredibly inflated list prices!" Hospitals also inflate charges to raise money for things that aren't related to treatments, said former Sen. David Durenberger (R-Minn.), who is senior health policy fellow at the University of St. Thomas in Minneapolis. "The biggest factor by far, in my experience, is what are you trying to cross-subsidize," he said. Hospitals will increase charges to finance things like technology upgrades and education and research and to compensate for their operational efficiencies, Durenberger said. Myriad reasons legitimately explain how a health care service may be priced much differently from area to area, including labor costs and other local economic circumstances. But such factors fail to explain price discrepancies among hospitals in close proximity, Huckman said. "There's no doubt that the variation in charges is significantly larger than the variation in the underlying costs for these hospitals," he said. The new Medicare database is replete with examples of inexplicably high prices and wide variations between hospitals in the same geographic area. The peculiar disorganization of the American health care system is evident by looking at just a few instances. In the New York metro area, Bayonne Hospital Center -- part of a chain called CarePoint Healthcare -- charges the highest prices for several types of procedures, including COPD treatment, among the regional hospitals reviewed by HuffPost. 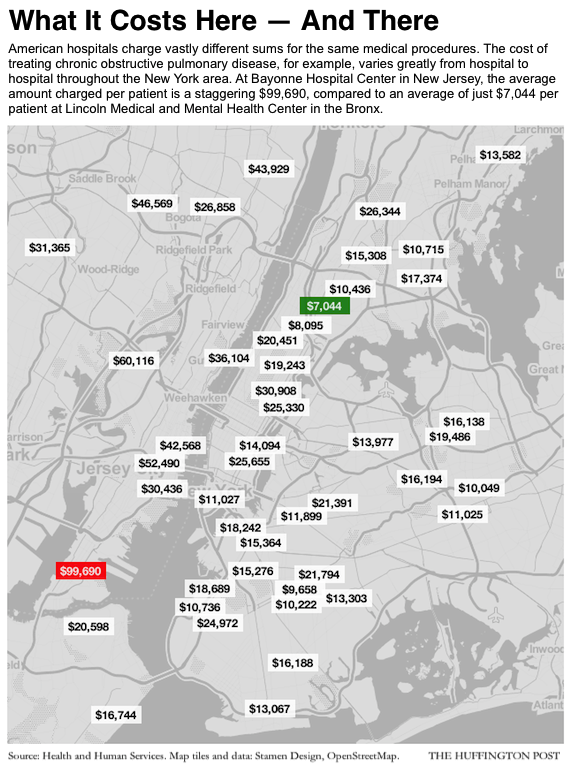 Its price for that treatment runs four times the average in the New York area, according to the database. Medicare -- the government health care program for older people and people with disabilities -- paid an average of $6,826 for these same treatments within the New York area -- or less than 7 percent of Bayonne Hospital Center's charge. Major joint replacement surgery at the hospital comes in at $155,769, which is almost three times the local average and more than nine times the price at Lincoln Medical and Mental Health Center in the Bronx. Medicare paid an average $18,944 in that area. Garfield Medical Center in Monterey Park, Calif., outside Los Angeles, charges $241,654 to take care of a patient undergoing renal failure with major complications, which is almost 10 times the price at Beverly Hospital about 5 miles away in Montebello and more than three times the regional average. And Birmingham's Brookwood Medical Center has the highest charges in 14 of the 24 Medicare billing categories in area facilities HuffPost reviewed, including a $156,958 price for simple pneumonia and inflammation of the lung. That's almost 12 times what the same treatment costs at Russell Hospital about an hour away in Alexander City, Ala., and about four times the local average. Loyola Gottlieb Memorial Hospital in Melrose Park, Ill., outside Chicago, charged the highest prices for 16 of the 24 procedures reviewed by HuffPost. For kidney failure, Loyola Gottlieb charged $97,926, more than twice average cost of 59 hospitals in the Chicago area. The price is more than five times what John H. Stroger Jr. Hospital, 12 miles to the east, charges. Those numbers reflect data from fiscal year 2011, and an official from Loyola University Health System, which runs the Gottlieb Memorial Hospital, said the hospital has reduced charges by an average 25 percent since then. "Loyola University Health System closely monitors charges and conducts reviews regularly to ensure that the health system is competitive in the Chicago market," said Chief Financial Officer Jay Sial, in a written statement. The other hospitals named in this article did not respond to or declined requests for comment. The public availability of hospital charges is unlikely to bring swift and radical change to pricing or spare uninsured patients from exorbitant bills, said Huckman, the Harvard health care expert. Still, he added, it’s a good start. "It would be hard for a hospital -- unless there's a justified reason -- to be able to preserve a large margin over what its otherwise equal competitors charge," Huckman said. "If someone knows the amount that even the most advantaged payer reimburses a hospital for a particular service and they can take that in with their own bill, I think that gives a pretty powerful opportunity for that customer to interact with the organization and say, 'Why is my number so different?'" Jay Boice, Aaron Bycoffe and Andrei Scheinkman contributed to this report.